Stephen Riley Photography: Somerset: Northern Soul at North Petherton Rugby Club, Bridgwater, Somerset, 9 January 2016 - a Review. How was the dance-floor scrum? Northern Soul at North Petherton Rugby Club, Bridgwater, Somerset, 9 January 2016 - a Review. I should start by warning those looking for comments on photography that this has not much to do with that. I’m a writer and Northern Soul fiend, too, and this is a reflection of those interests. Having had the event in my sights for a month or so, I found myself felled by a respiratory tract infection, which laid me low for at least a week. But as the night arrived, I just HAD to go. I missed the music and dancing so badly that I felt compelled, whatever the consequences. I went alone because, if I was ill, that was nothing to the state my partner was in. I left her wrapped-up with blankets and hot water bottle, watching old re-runs of ‘Call the Midwife’ (itself, a kind of televisual blankets and hot water bottle). So, I was quite late arriving. It wasn’t until gone 8pm that impulse to go overcame my physical constraints (and probably common sense). Then I had to get ready and then I had to find a cash point and petrol. And then I had to drive from East Somerset to West, having no knowledge of the area and only a loose grasp of the location. As it turned out, while I was pulled-over in a lay-by, fumbling with the map option on my singularly uncooperative, not-very smart phone, I could hear the music a hundred yards or so ahead. The place was impressive. I have been to many Northern Soul dos in rugby clubs, community halls and such, and they are often quite basic (and that’s the polite version). But here, there was a large car park, properly tarmac-ed and with clearly painted spaces. It was pretty full but there were still spaces left at the far end. I swung in. The building was single-storey, clean, neat and well looked-after. I floated down the corridor, drawn by the wonderful music, quickly handed over my 6 quid, got a stamp on my hand and slipped into the room. A sign said ‘no talc’, but few, I think, would have found it necessary. The dance-floor was made of wooden planking, planed perfectly smooth. Dancers glided over it with ease. The place was busy, but not to the extent that it was too tight to dance. I didn’t know anyone in the crowd, but I knew 2 of the DJs – sort of. I’d met Ginger Taylor back in the mid-70s, at the Northern Soul nights at Bay Horse in Todmorden and then en route to the Cleethorpes All-Nighter: my mates and I had pulled up at the roadside – no doubt a consequence of the couple of hours we’d spent in pubs, taking several pints of refreshment on the long journey from Manchester to Lincolnshire – and Ginger and his mate Eddie pulled over, thinking we had broken down. Ginger and Eddie were well-known faces even then. They were on their way to Cleethorpes as part of the DJ line-up for the night, so we felt that we’d been visited by Northern Soul royalty. Many would not have stopped, and it is indicative of Ginger’s friendly, avuncular nature that they did on that night. And that was reflected on this night too, as we chatted at the bar. 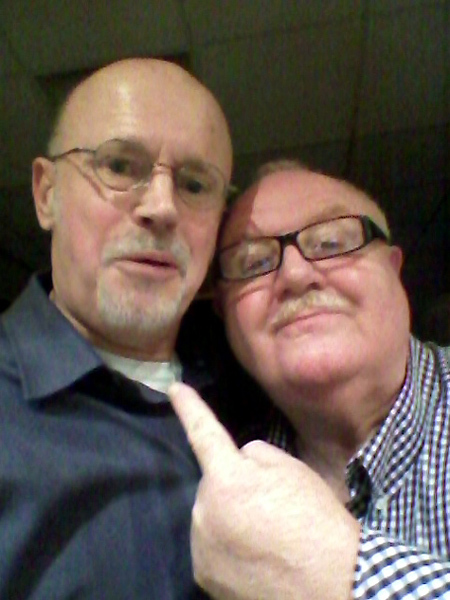 Of course, Ginger didn’t remember me – not only do I look nothing like I did 40 years ago, I was one of 1,000’s of Northern Soul partiers back then, when he was a well-known name – yet, he was friendly, chatty and it was as though we had known each other throughout those years. I had also met Neil Rushton at about the same time, in an even briefer encounter. With record collector extraordinaire, Al Birkhead, and a couple of others, in Al’s red Datsun Cherry (who remembers those? ), we drove to Neil’s house to buy records. At this distance, the memory is vague, but Neil was already a mover and shaker on the scene and was probably importing and selling records, though I’m not sure how keen he would have been to have punters arrive unannounced at his door. As I recall, his home was on an estate somewhere on the outskirts of Walsall. I don’t think I bought anything, but the others came away with a bundle of copies of ‘Condition Red’ by the Baltimore and Ohio Marching Band. My feeling for that track, then and now, is probably why I came away with nothing. Back to Saturday night, and Neil spun a couple of significant new records (well, old records rediscovered). First, a track by the Precisions on Drew Records, which he said was one of only 4 copies in the world! I wondered if I’d heard him correctly over the PA, so went and asked, and he confirmed it. Maddeningly, I can’t remember the title, but clearly it wasn’t the ubiquitous ‘If this is Love, I’d Rather be Lonely’, of which everyone has a copy. Next he played ‘Treats Me Right’ by Shades of Blue (whom most will remember for the classic ‘Oh How Happy’) on Impact Records. This, Neil announced, was its world debut. So far buried in the vaults was it that it had never seen light of day till now. Both were great tracks, which packed the dance-floor as readily as the well-known stuff. As for me, I developed a pattern: I danced to a couple of tunes, then found a piece of wall to lean on and waited out the next four or five, while coughing up my brogues and listening to my trachea telling me that if I dared do that again it would see me off. But I did do it again, several times over, and survived. But eventually it was time to leave. In conclusion: the venue, the music, the dance-floor and the atmosphere were brilliant. I can think of nothing to fault, other than the state I was in. My phone seemed to empathise with my condition: its battery was on the last blip, and when I took the shot of Ginger and myself, it didn’t have enough left to fire the flash and would only give us a handful of pixels, so there we are, preserved blurred for digital prosperity.